Last night the rain was pouring down, hammering the windows making the last night strays from the pub scurry past to get home as soon as possible rather than doing their usual leisurely walk home. The reason I know is because they are usually quite loud, mainly happy and laughing. The rain seems to have washed that away and I could only hear hurried steps. It is quite cold outside so I guess walking home from the pub late at night in the pouring rain must have been a little like ending your night with a very cold shower. It made me appreciate being dry and warm inside. I fell asleep and the sun was shining when I woke up. It is still cold outside but a lovely day. We went for a walk and I found the first wild fennel of the year! I hadn’t expected to forage so this was an unexpected and lovely treat. I grew up by the sea and there is something special about living near water. It creates an ever changing landscape and always gives me a sense of space. The wild fennel was plentiful and inspiring and I couldn’t wait to cook with it, the smell was so strong. Finding the wild fennel coincided with Angie’s amazing Fiesta Friday party, a celebration, part 1 of the party anniversary. Part one is nibbles and starters, a great way to start a party! I thought I would start by bringing broccoli and wild fennel shots and a big plate of steak salad. The salad isn’t quite an appetizer but it is easy to pick from and it is a great mix of hot and cold, filling but still quite light. Place the chicken stock in a pan. Slice the spring onion. Peel the broccoli stalk and potato, cut up in to chunks. Cut the top layer of the broccoli floret and save for garnish, chop up the rest. Add the broccoli, 2 sprigs of wild fennel, stalks removed, scallion and potato to the stock and bring to a boil. Boil down until half of the liquid remains. When half of the liquid remains pour the soup in to the blender with the blue cheese until smooth. Separate the pork in to strings. 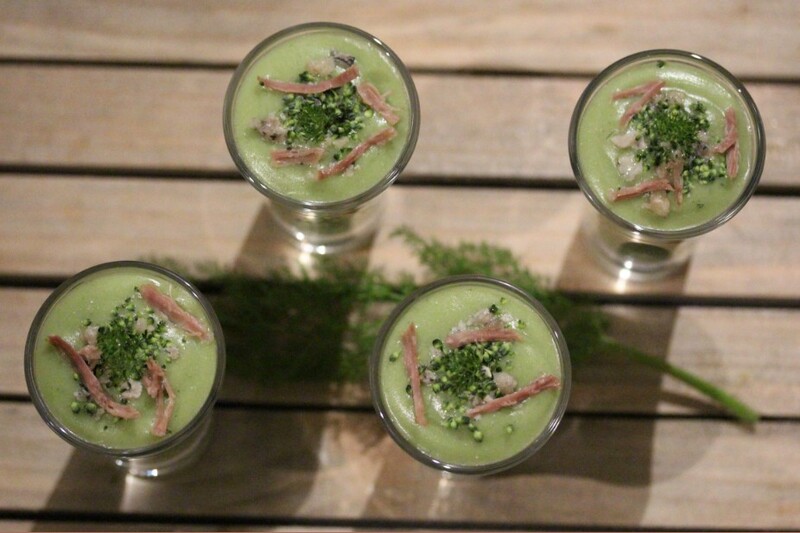 Pour the soup in to shot glasses or how you wish to serve it and garnish with a few pieces of crumbled cheese, the broccoli tops and the pork. I had a craving for red meat and the butcher had a skirt steak that would be great with a salad. isn’t that a perfect combination! Peel and cube the butternut squash. Remove the outer leaves from the Brussels sprouts and cut them in half. Place in a plastic bag. Mix the oil with the salt, pepper, sesame seeds, paprika powder and the cayenne pepper. Add it to the vegetables in the bag and mix until all of the vegetable pieces are covered. Roast until cooked through and they start to caramelize in the edges. Depending on the size it should take about 35-40 minutes. Slice the endive last minute before serving. Dry roast the pecan nuts, break them up slightly and add a little salt and pepper when they are hot. Set aside to cool. Peel the clementine and divide in to segments. Cut each segment in to four pieces. Cover and set aside until you are ready to put the salad together. I did a blue cheese dressing as I love the combination of the bitterness of the endive and the saltiness and flavour of the blue cheese. Give the cheese a rough cut, slice the spring onion and place all of the ingredients in a food processor. 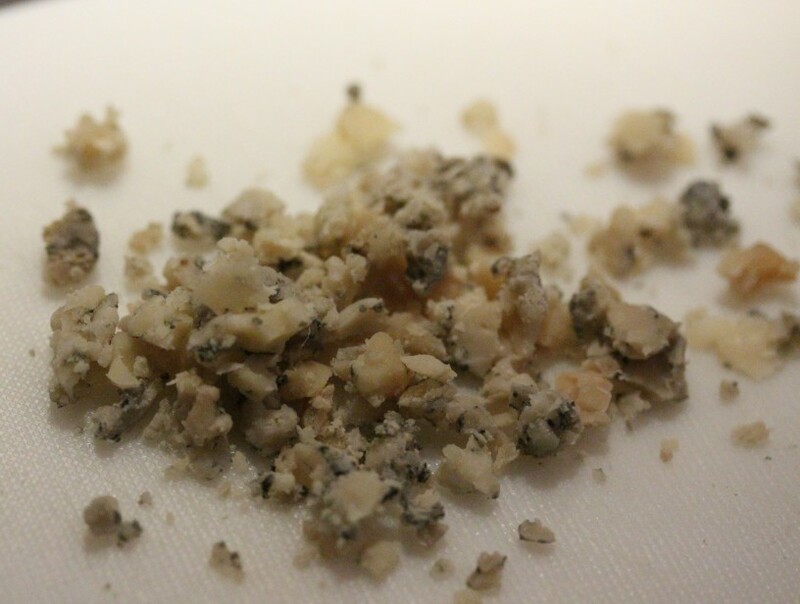 I like a little texture in my blue cheese dressing so don’t mix it too much. Trim the meat and add salt and pepper. Heat oil in a pan and add the meat when the oil is hot. The skirt steak is so thin it cooks quickly and you need a nice caramelized sear on the outside. When cooked as you like it let it rest for about five minutes. 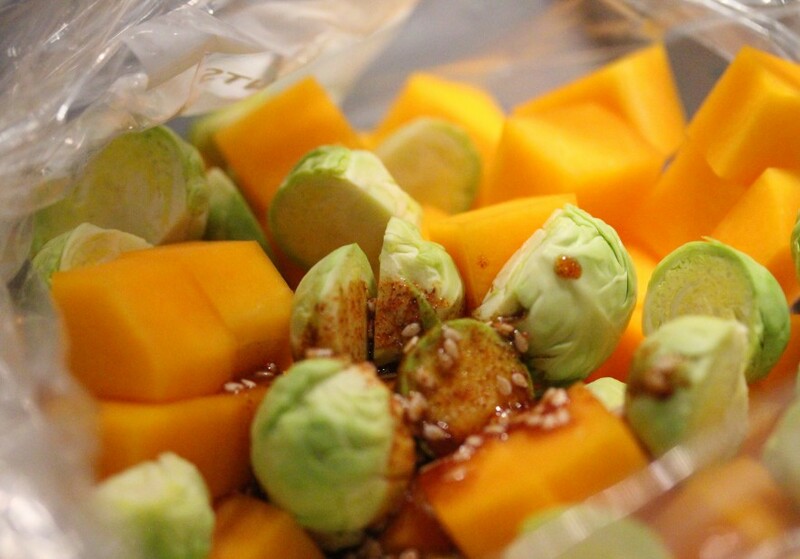 Take the roasted butternut and Brussels sprouts out of the oven. Plate up, slice the endive and scatter over. Add the wild fennel but not the stalk, the roasted pecan nuts and mix. Drizzle over the blue cheese dressing and serve the rest on the side. Slice the beef against the grain and place on top with the steak juices. I had an onion butter to go with the steak and added this before serving. 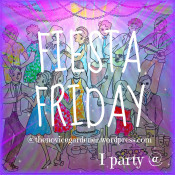 I am now heading off to celebrate the first Fiesta Friday anniversary. If you have cooked something come and join me or just click through here and prepare to get inspired and hungry. Happy Fiesta Friday anniversary! It looks like it might be the biggest party yet and she has two lovely co hosts, Hilda, Along the Grapevine and Julianna, Foodie on Board. I am not quite sure where to start describing their blogs but besides beautiful pictures they are innovative, inspiring and of course, full of simply delicious recipes! This all looks so beautiful and delicious! Thank you so much 🙂 I am glad you like it! Beautiful! Such lovely writing and delicious food. I adore (ADORE) blue cheese with beef! Thank you so much. Cheers, new friend! I would just love to live next to the sea. I love your experience and stories of it. I love fennel and have really increased my use of it. 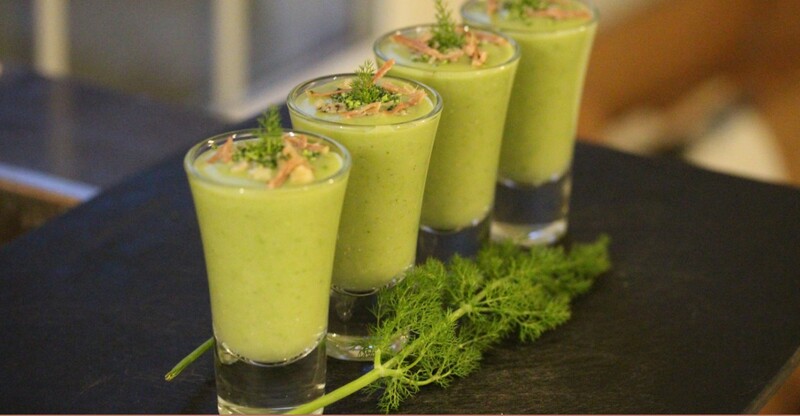 Your shots and stead salad look delicious! Thank you! The sea is amazing, I think it just creates an atmosphere that makes life even better! I agree on both counts. I can just watch water for hours and with a steak in any way I am in heaven. 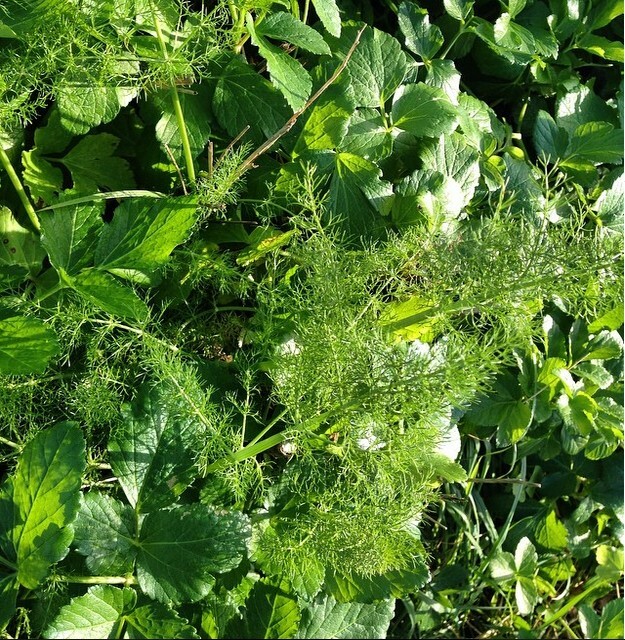 First of all, I love that your shots are based on wild fennel – and that you show pictures of where you found it. So much more interesting to find local food than go to a grocery store all the time. A very interesting and creative recipe indeed. The vegetables, dressing and meat clearly illustrate you are a very talented gourmet cook. Thanks for bringing them all to the party. Oh It was a bit of a Hilda moment when I found the wild fennel! 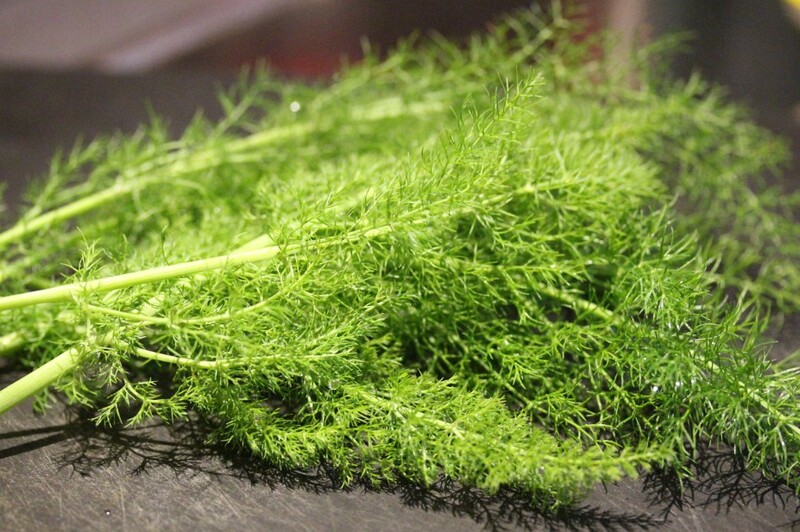 I love to forage and I will pick more fennel before it grows too large, it is so delicious! I am glad you like it and yes it is much more fun than buying pre packed food. I am flattered you should call it a Hilda moment. I just wish we had some of that around here. I wonder if regular fennel would work too in this recipe. Hello there Paula, thanks for popping by my site – I wondered idly whether Paula 08 was a birthdate, but that would make you very very young to be blogging 🙂 so maybe its when you started the blog 🙂 – thanks for stopping by, breathtaking photos on your blog, love the wild fennel and broccoli shots I am sure they taste divine and the colour is awesome! Many thanks for stopping by! I am glad you like the blog, the shots were so nice and I love to forage, this was a great surprise to start so early in the season! I started the blog, very modestly in 2008 and well, my birthyear was a bit before then 🙂 Am looking forward to reading more of your posts. Hi Petra – I see – that explains it – unusual name – quite common in Switzerland haven’t met a non-Swiss Petra yet – you are the first! Foraging is great, takes you back into contact with the environment, and we don’t do that often enough. There is also that sense of pride, when you “discover” something 🙂 – look forward to reading more! I would have thought there were mushrooms in the UK? Your Swedish background and the love the woods is now clear, we spent some holidays in Sweden when I was a child during blueberry season – and I remember all the delicious things that came straight from outdoors to the table from the lakes or the forest – yum. 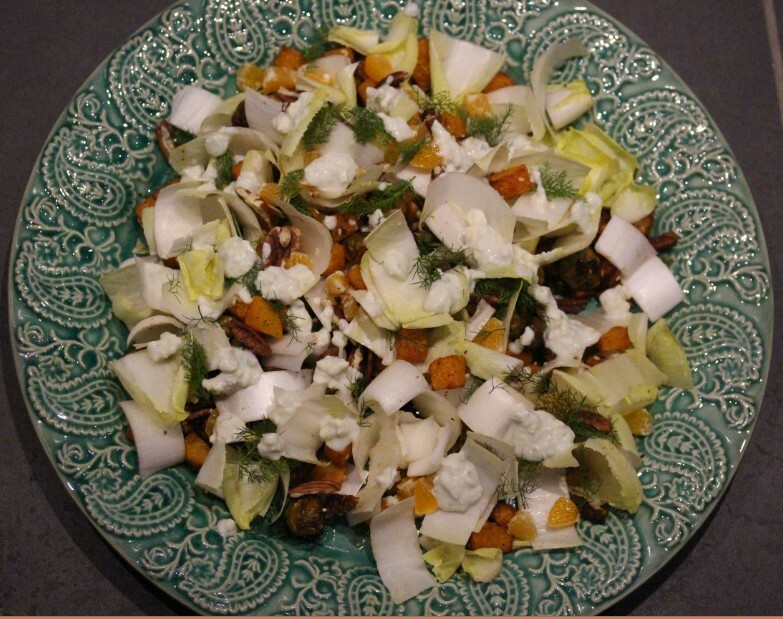 Do you know the cookbook Aqua – by Swedish author Makus Samuellson who now lives in the US – has some nice recipes on those lines in there and lovely pictures! #There are lots of mushrooms but having only ever picked girolles I am unsure about other mushrooms, I should go on a mushroom foraging course one day! We used to pick blueberries and wild strawberries and put them on a straw and then eat them. I have seen Marcus on TV but not seen his cookbook, I must keep an eye out for it! Thank you 🙂 It was healthy even if I didn’t set out to make one, and the broccoli was actually left overs from the broccoli for roasting with the steak 🙂 It worked so well with the wild fennel I will go out and pick more soon. Oh, this post was made for Hilda, the Queen of foragers!! How I miss Deal – it’s been too long since we visited – I really must remedy that. 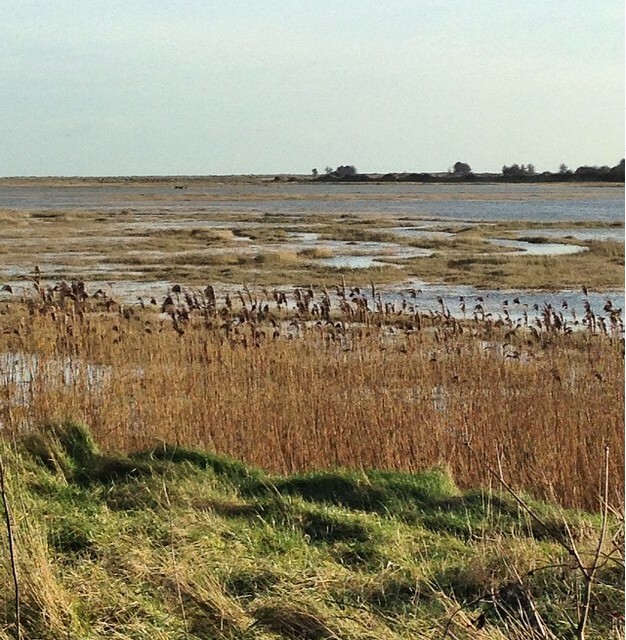 I love foraging for sea asparagus and mushrooms there. Lovely prose too Petra. 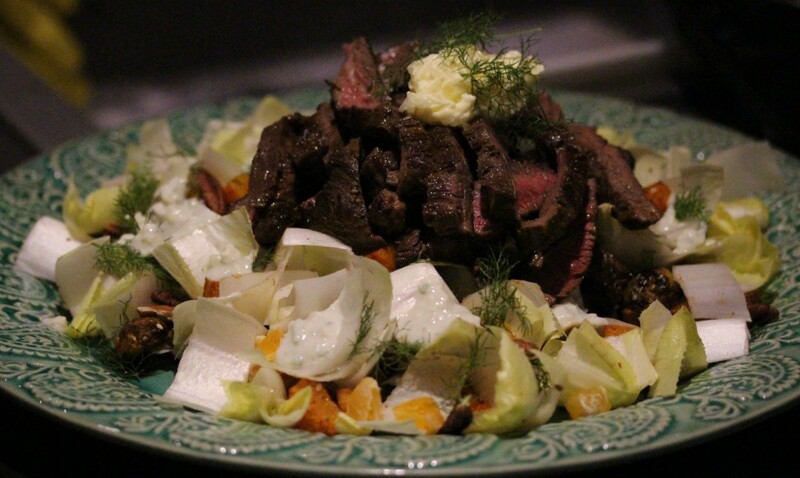 Your shots are inspired and steak salad is something that I enjoy very much! Petra, I have every intention of meeting up with you when I visit Deal! I understand that there are many places to forage – one place is up by the golf course – it’s just a matter of being at the right place at the right time! Thank you! The shots were great but I have to admit there was some muttering about the fact that they could have been larger, maybe next time! Wow, Petra, these shots look and sound amazing! You come up wth the most fabulous things! !